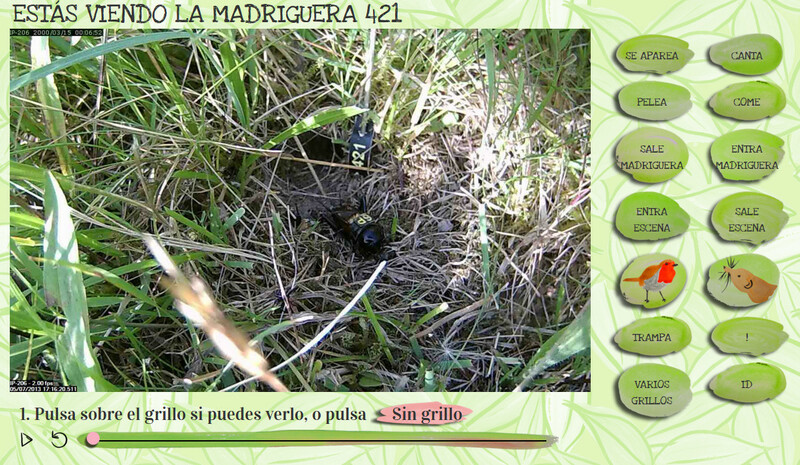 Cricket Tales is an ambitious citizen science project. 438 days of CCTV footage from the Wild Crickets Research group – the only record of wild behaviour of insects of it’s kind. It turns out that insects have more complex lives and individuality than we thought, and the game is a way of helping uncover this more precisely. For Foam Kernow, this was also a significant project as the biggest production that all three of us have worked on together. My favorite aspect of this project is that the movies are a strangely different way of viewing an ecosystem, tiny close up areas of a perfectly normal field in northern Spain. The footage is 24 hour, with infrared at night, recording a couple of frames a second only when movement is detected. Some of the videos get triggered when there is simply movement of shadows, but there are plenty of moments that we wouldn’t normally notice. Worms and bugs of all kinds going about their lives, sudden appearances of larger animals or swarms of ants, condensation of dew at dawn. The crickets themselves, mostly with tags stuck to them so we can tell which is which, but other than that – this is their normal habitat and way of life. Compared to the study of insects in lab conditions, it’s not surprising they act in a more complex way. Screenshots from the Spanish version, as I’m particularly proud of that (my first experience using GNU gettext with Django). We combined the task of watching the 1 minute long movies with the ability to build houses for the crickets – we needed to provide a way for people to leave something behind, something that marks progress on this gigantic collective task. You get to design a little house for each burrow, and your name gets recorded on the meadow until the next person takes over by watching more videos. We’ve had plenty of conversations about what kind of people take part in this sort of citizen science activity, what the motivations may be. We ask a couple of questions when people sign up, and this is something we are interested in doing more research on in general for our projects. In this case, we are interested in depth of involvement more than attracting thousands of brief encounters – it only takes a few motivated people to make the researcher’s jobs much easier and provide some data they need. For me a bigger objective of Cricket Tales is as a way to present more diverse and personal views of the world that surround us, and tends to go unnoticed. Being asked to contemplate a tiny organism’s view of the world for a minute can be quite an eye opener.